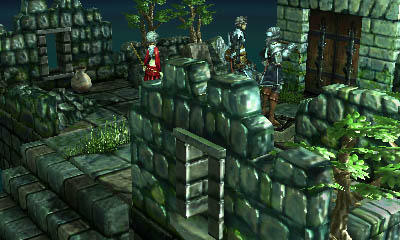 I considered just doing a mini-review of Level 5's Nintendo 3DS RPG Crimson Shroud. After all, how would a simple $7.99 digital-only title be considered comparable to the rest of full games out there? But after playing it, I realized that such a small review couldn't possibly do Crimson Shroud any justice. Not only does this game deliver a full package that so many fail to provide these days, it does so at that same $7.99 price which might turn off skeptics. 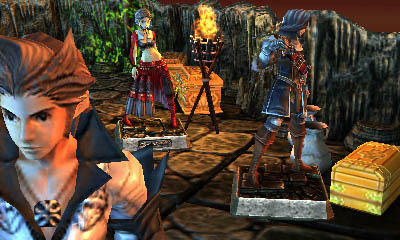 Crimson Shroud is not your average digital only game. It is a full blown JRPG from one of the genre's greatest minds, and it delivers twenty hours of smart and thrilling gameplay you'll be happy you didn't overlook. While RPGs are generally lauded today for their settings, stories, and characters, the true workings of what make them so great occur in the math underneath their beautiful presentation. All RPGs, Western and Japanese alike, take influence from tabletop RPG classics like Dungeons & Dragons and even older games created before this whole electricity thing really started to take off. 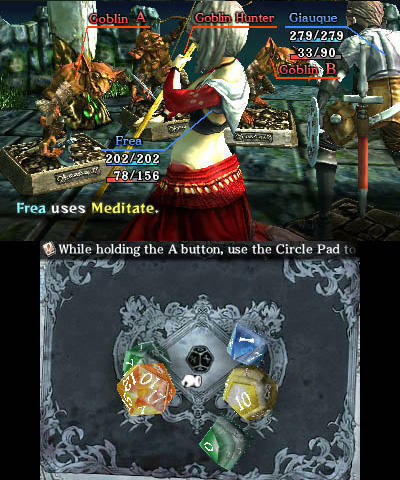 To play these games, at least some imagination is required to tell fabulous stories and create characters, but mechanics have by and large been controlled by the roll of the dice. Damage in battle, swindling and dealing in store, results of risky decisions, everything is determined by chance and the mathematics behind it. All of your favorites from Final Fantasyto Baldur's Gate follow this similar setup, but they cleverly disguise their roots with simple interfaces and menus designed not to boggle the minds of those just looking to have fun with a story. Crimson Shroud proposes that you don't look past these tabletop roots, so much so that everything about it suggests that this could have been a real board game if that's what mastermind Yasumi Matsuno wanted. 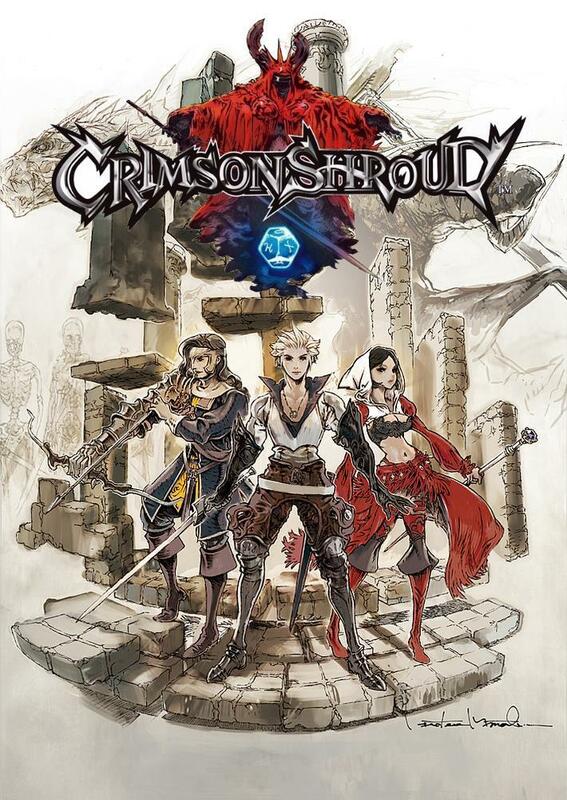 Crimson Shroud provides you with three characters, a fighter, a ranger, and a magic caster, and it sets you off dungeon crawling through a dangerous ancient castle. 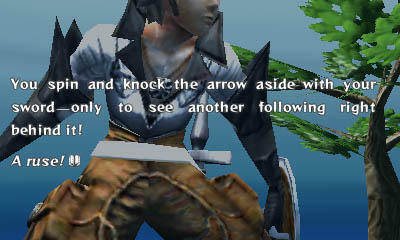 Of course, our three protagonists are bound to stumble across some unsightly foes down in the depths. 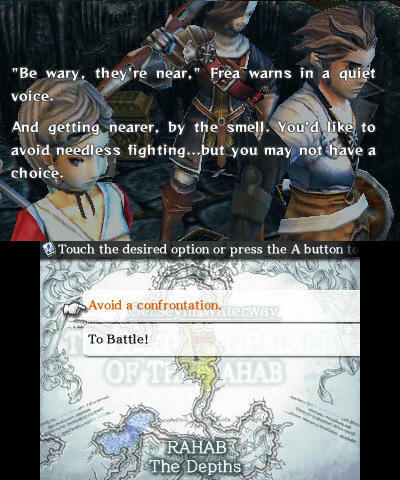 Battles play out much like a traditional JRPG would. When coming across an enemy, you'll be granted the options of Attack, Magic, Item, and Skill. While it might come off as Final Fantasy at first glance, Crimson Shroud slowly and brilliantly unveils all of its unique qualities one at a time, perfectly paced so as nothing can be overwhelming or overlooked. For example, characters can make two actions per turn rather than just one, much like any Pathfinder session with your buddies. One of these must be "Skill," which has such abilities as recovering Magic Points, buffing your characters, debuffing your enemies, and possibly cause damage with a few rare abilities. If you like the idea of "buffs," using skills to affect characters statistics, then Crimson Shroud is right up your alley. The other commands "Attack, Magic, Item," can take up the other half of a turn, and they are pretty self explanatory. Attack with a weapon, cast a spell, or use a consumable item. When characters use different elemental attacks like Fire, Thunder, and Water, they can start a combo chain. Once that chain gets long enough by using all of the elements, they are rewarded with an actual game dice of increasing value. 1d4, 1d6, 1d8, 1d10, 1d20. Am I speaking your language yet, Dungeons & Dragons nerds? 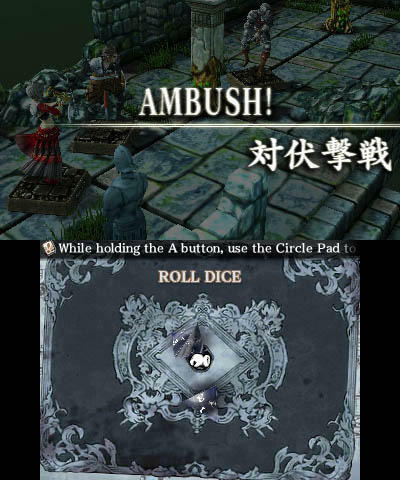 Crimson Shroud touts its board game roots by actually allowing gamers to physically roll them through the Nintendo 3DS touch screen, refusing to hide its RPG roots behind simple menus. It's all there, right in your face, and its so realistic that careless gamers can even toss the dice straight out of the mat they are supposed to aim for! These dice are mostly used to determine the success of a debuff on an enemy, but bonus dice obtaining through combos can be called upon to improve the chance of an attack succeeding or boost damage caused by a spell. Dice also come into play when trying to avoid battle or determining which character has to dig through the corpse of a minotaur to pick up a key. As fun as this simple setup is, the dice don't even begin to scratch the surface of how deep down the rabbit hole Crimson Shroud's mechanics go. Keep in mind that this is a Yasumi Matsuno game, the man behind intricately complex battle systems like Ogre Battle, Vagrant Story, Final Fantasy Tactics, and Final Fantasy XII. One way in which Crimson Shroud departs from the typical JRPG fare is that its three protagonists do not level up in a traditional sense, but rather it is their equipment which takes center stage. Treasure chests and the slain bodies of enemies grant new swords, armor, shields, magical staffs, and consumable items, and Crimson Shroud is not shy with its inventory. There are a LOT of items to uncover. 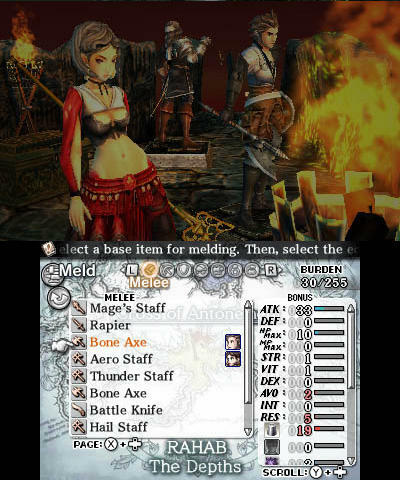 Equipment also teaches the characters the Skills and Magic they bring to battle, and the game's complex melding system can attach magical scrolls to weapons and armor, permanently allowing them to be cast as long as that item remains equipped. To take it one step further, two of any kind of matching weapon, armor, or accessory can be melded together, boosting the stats it provides the heroes with. 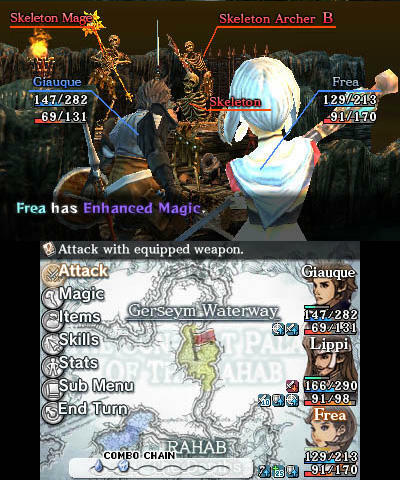 You can uncover the best weapon in the game, and it still might be paltry compared to that Battle Axe +9 you've created by fusing together all the spoils you've collected in battle. A long time will be spent determining which of your armor pieces will be best suited for some of the more challenging boss fights, especially in the New Game+. If it sounds like a spiritual successor to Vagrant Story, another deep Matsuno game which depended more on equipment than levels, then you are not too far off. Every system works in tandem with the handful of other systems it lays on the table. Crimson Shroud is one of the best balanced RPGs in history when it comes to handling all of its ideas, and it pays off tenfold once you are able to wrap your mind around them. Very few missteps roadblock this game, and aside from a questionable game design choice involving hunting for keys, you shouldn't have trouble totally losing yourself in this game's bottomless potential. Want to build an ultimate armor and weapon set? The New Game+ allows you to carry over everything, and you can grind away finding more game pieces to fuse together. Want to speed run through the easy mode after building your stats to incredible heights? That's an option too. A good ending and a bad ending are not the only reasons to dive into this game more than once. I am already eager to take it on a third time after shutting the book on both easy and hard mode. 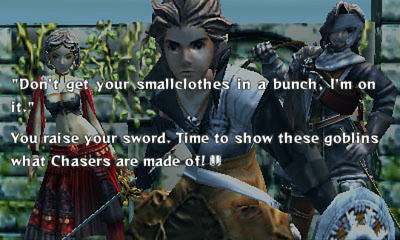 Luckily, the game is just as charming as it is deep. Dice are not the clever way in which Crimson Shroud uses to throwback to tabletop RPGs. Its boardgame approach to combat carries over into the game's fabulous presentation, and the true genius of it all can be found in how such an intriguing tale can be told with such graphical limitations. What kind of limitations, you ask? How about completely immobile characters models. Our three heroes are represented as solid game pieces, and each member of the cast only has two poses in which they can express themselves. The only animation you'll get out of the game pieces is when they tilt and nod as you select them in battle. To add to the stiffness of it all, these characters interact and talk on tiny sets set up to look like a game boards. Only the fire and torches provide any signs of life and movement. Those familiar with Yasumi Matsuno's brand of deeply political and religious storylines are probably wondering how such a limited setup can match the standards of what he generally delivers. For lack of a better word, and trust me, I HATE using this word, but it is done totally through the game being "cinematic." I don't mean "cinematic" in how AAA gaming has become amateur hour in trying to rip-off the latest ridiculous action trends in Hollywood, but rather through genuine and genius cinematography. Character placement to show their relationship to others; camera angles used to bring focus to a character's role in a scene; framing and shot composition, lighting to create a mood or characters emotion; blocking to hide an element you are not yet supposed to see. It's all there, 100% mise-en-scène like I've ever seen it in a game before. If AAA development is Die Hard 5 or a Michael Bay flick, then Crimson Shroud is a Wes Anderson flick. Its visual language is so rich and precise that you almost forget you are looking at peg people stylistically designed to look like peg people. Close ups into our heroes faces really give them that extra sense of humanity that falls way short in a lot of other games, and you really sympathize and feel compelled to help these people in their desperate quest. And yet, they are still board game pieces! While all these horrible situations are playing out around our heroes, it's also endearing and almost funny that these little game pieces are used to create such excitement, dread, and emotions, all through the marvelous language of cinema. 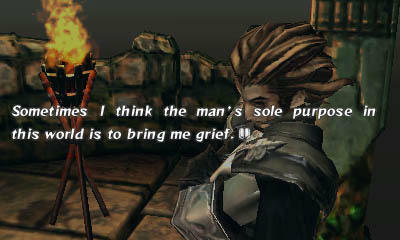 Which comes to our last important point of any RPG, the storyline. As mentioned before, Yasumi Matsuno is often put on a pedestal for his deep stories and unique sense of medieval fantasy. The man created Final Fantasy's Ivalice, an enormous kingdom cluttered in political intrigue, religious oversight, questionable origins of magic, and suffering of the common man. How can Matsuno recreate such a sense of story in a seven hour game, especially one in which a lot of time is spent grinding? 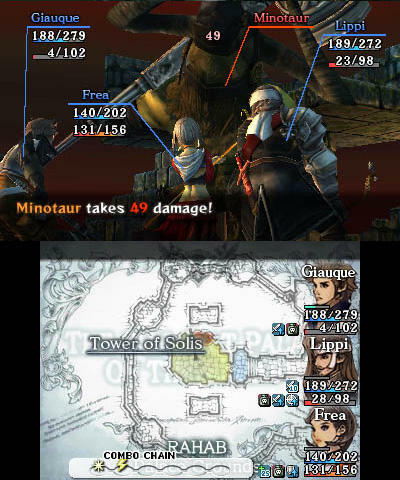 The magic of Ivalice, and all of Matsuno's games for that matter, is each plot feels part of a larger world whose history and lore is far more important that the events taking place at hand. This is how Final Fantasy Tactics, Vagrant Story, and Final Fantasy XII can unfold over the history Ivalice, but yet still feel unique with each passing tale. 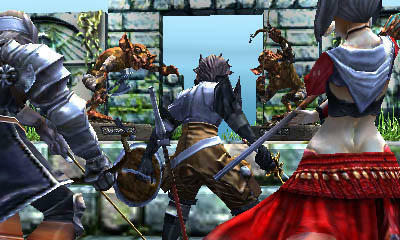 The same can be said of Ogre Battle and Tactics Ogre, which are believed to take place in the same world, and The Unsung Story, Matsumo's next game believed developed by Playdek. The point is that the events of Crimson Shroud are but a fluttering light on the world it takes place in, a self contained instant in a larger world, and Matsuno does a fabulous job of setting up both a believable fantasy world and telling the tale of our three heroes in the short hours he has. It moves at a breakneck pace, so you might have to play it once or twice to get it all, but that is just another reason why this game's short length is actually a strength. 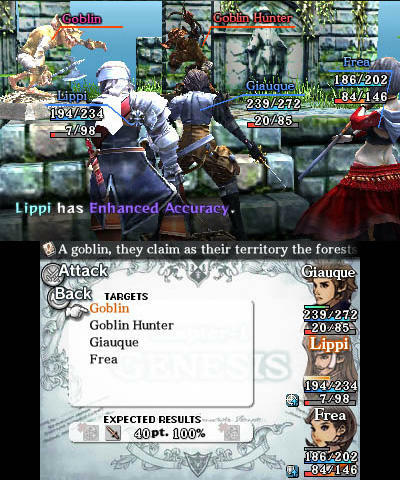 Giauque, Lippi, and Frea are Chasers, this world's term for mercenaries, and they are hired by a political figure to uncover the fate of a missing scholar. 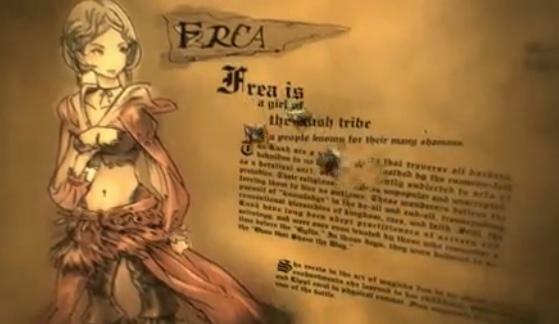 The entire game is told through the flashback of a badly injured Frea as she recollects her tale to her captors. She and her companions strode away from their mission objective to uncover a secret they uncovered while on the case. Of course, this required them to dive deep into a ruined and ancient castle populated by goblins, skeletons, and something much much worse at the bottom. Crimson Shroud's tale does provide all of the intrigue you can expect from Yasumi Matsuno. Everything genuinely feels like a well written Dungeon's & Dragon's campaign told by one of our most brilliant storytellers. Never once does it let up the fact that something terrible has happened to Lippi and Giauque, and as you get to know them, and the world they live in, you feel more and more sad that their fate seems almost unavoidable. You feel motivated in playing the game, hoping to save them from a fate you are only assuming has happened to them based on how their story is presented. Are they alive? Are they dead? You'll have to play to find out. All the meanwhile, twists and turns will present themselves in each chapter, and exploring the dungeon deeper and deeper allows for more chances to reminisce on the backstories of these tragic heroes. As with most endings in Matsuno's games, Crimson Shroud's true ending will certainly leave a mixed taste in a lot of mouths, and the New Game+ option allows for a happier ending that comes as tacky and slapped on. It's up to you to determine which ending you want to believe, something that has always been a sticking point in many of Matsuno's games. And who knows? Maybe Matsuno will return for a follow up. Crimson Shroud's world is ripe for delivering all kinds of stories in, and the treasure hunt of three mercenaries barely touches on what can be done with the material. Graciously, Level-5 also went about hiring many of Matsuno's frequent collaborators. Hiroshi Minagawa and Akihiko Yoshida provide the art for the world and the characters respectively, and the music has been composed by Hitoshi Sakimoto and members of his studio. All perfectly match the tone of the game, and the limited publisher interference makes this game obviously look like it turned out as envisioned. Give it a shot. 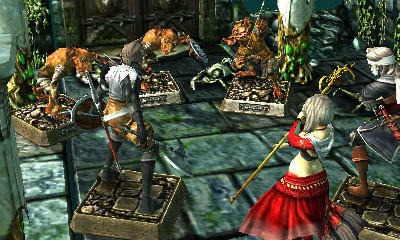 Some of the grinding, exploration, and slow moving battles might be a little off-putting for more casual fans of the genre, but those looking to further douse themselves in a brilliant RPG the likes of Vagrant Story, Final Fantasy Tactics, and Tactics Ogre shouldn't hesitate for a second to pick up this minor masterpiece. At $7.99, you won't find a better deal on the Nintendo 3DS, and some folks might have even gotten lucky and picked it up when it fell to $2.99 when Weapon Shoppe de Omasse launched in February. I can't even begin to fathom the ratio of great gaming hours to dollars that deal landed them. Keep in mind one more time that this is not a typical throwaway digital only game, and that this a stigma Crimson Shroud must be overcome if it is to ever be heralded as it should be. It definitely at least deserves a footnote when mentioning the all time greats. This is the real deal, a fully realized JRPG encapsulated in a small perfectly sized portion. Just a quick shout out too, this game was part of a compilation called the Guild series published by Level-5. Not all of these games are up to snuff with Crimson Shroud, but if you want another fun little outing, be sure to check out Attack of the Friday Monsters: A Tokyo Tale. The two titles are the marquis of the bunch. We purchased Crimson Shroud with personal funding and beat both the New Game and the New Game+ before writing this review.